I do not know what caused it yet, but I am relatively sure at least one hive has expired. 1001 was one of my first two colonies. I bought it as an established hive from a beekeeper that was going out of business. It had been on the previous owner’s program of yearly requeening, massive doses of sugar syrup and chemicals treatments to kill nosema and varroa. How did I make this determination? This seems like a long and tortuous story, but bear with me and I will get to the point. Attic Boxes in action last year. First some background information: The winter of 2012-2013 was a first. After being involved with several cutouts last summer I was having second thoughts about making things too easy on my bees over the winter. In all previous years I had converted swarm traps into attic boxes every fall. I did this with the idea that I wanted ALL of my colonies to overwinter. 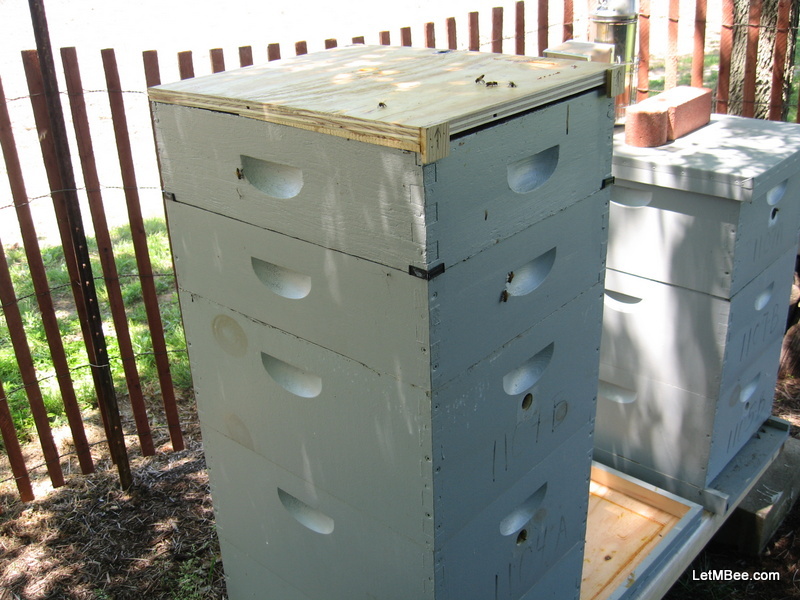 Some of the cutout observations made me change my tune to wanting only the most robust and healthy hives to overwinter. This will not only get rid of my inferior genetics, but free up boxes for 2013’s swarms. Doesn’t look to cosy to me. The cutout from 7/28/12, was a major factor in my changing view. I featured it in the post Saturday Morning Cutout. 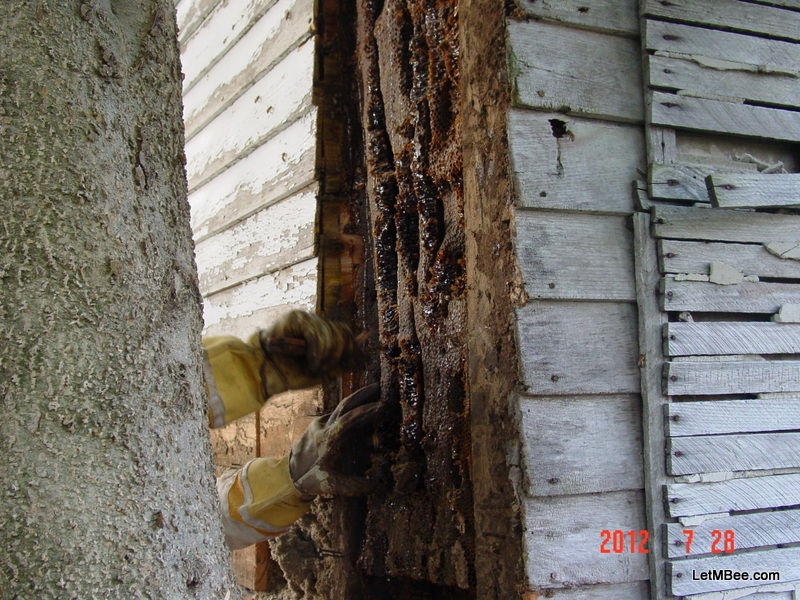 This hive was located in the North-West corner of a house that had been abandoned for 25-30 years. It is very flat here and during the winter the North and West winds can be brutal. The space that the hive occupied was approximately 15″ x 4″ x 10 FEET. Only about 3 feet at the bottom was left for brood and other hive activities. The rest all the way up to the top was filled with capped honey. 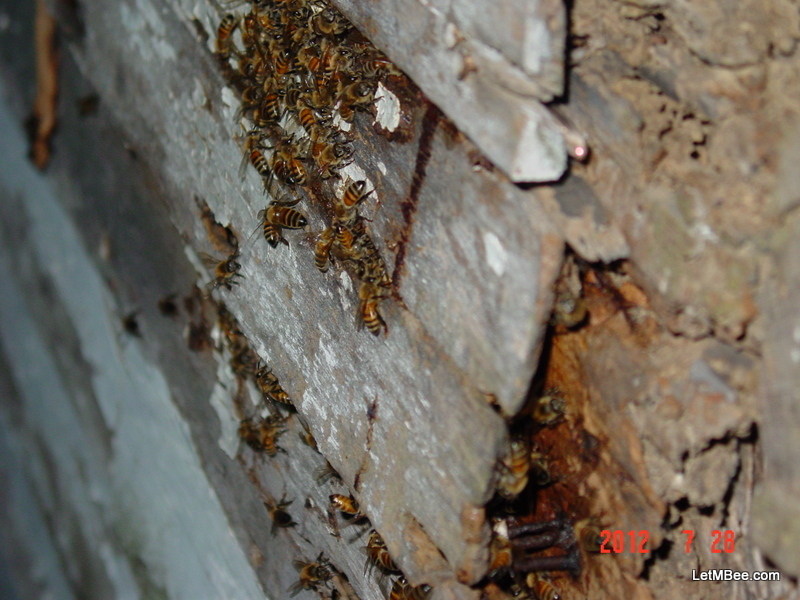 The only thing between the bees and the outside air was some very dilapidated wood siding that was riddled with holes. The house had some insulation between some of the studs but NOT in this corner cavity. The bees living here were a little ill tempered, but definitely had what it took to survive. These are precisely the type of bees that I want living in my hives, good honey producers that don’t need a beekeeper around in order to survive. I had initially hoped for more time last fall to do a proper trial of overwintering techniques when writing What to do. Due to time constraints and last years mold problems I decided that instead of the attic boxes all hives would get one of my top-entrance inner covers. 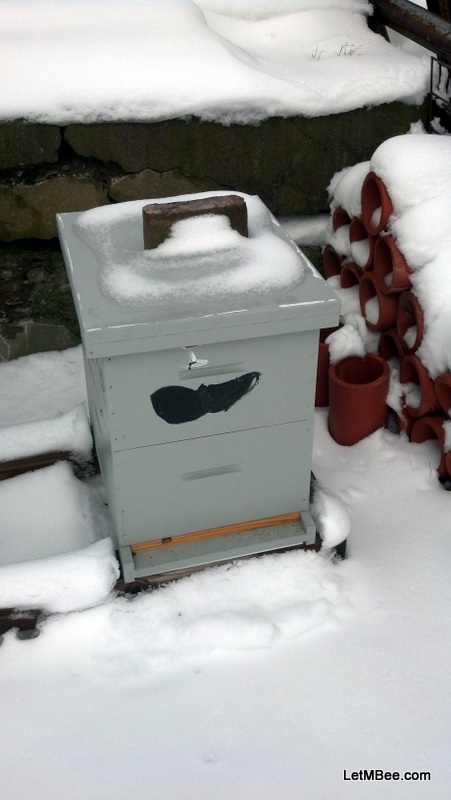 All hives were provided with one form of winter protection. I made sure they at least had some form of windbreak from the North and West, but beyond that they were going to be on their own. 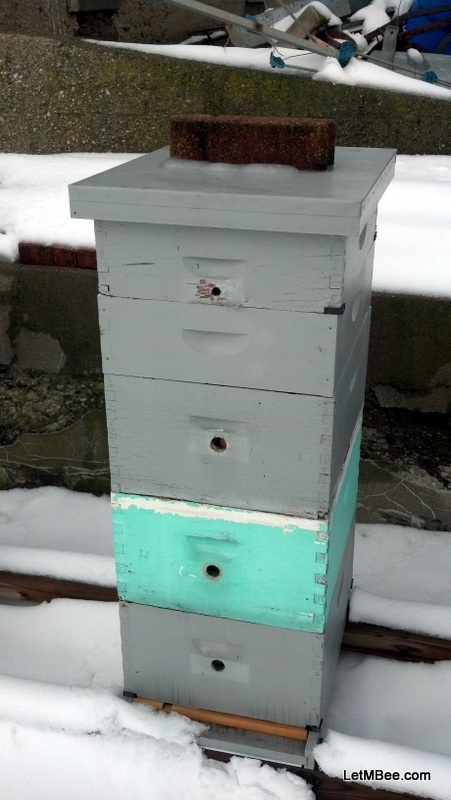 I was passing by a place with three hives on it on 3/7/13. I had a lot to get done that day so I didn’t get a chance to do anything more than snap a couple pictures and place my ear next to the hives for a listen. At the time humming was audible from only two of the hives. It wasn’t until I got home and looked at the pictures that I made an amazing observation. The uninsulated inner covers gave away a secret as to what was going on inside. On 3/7 there was still some snow around. 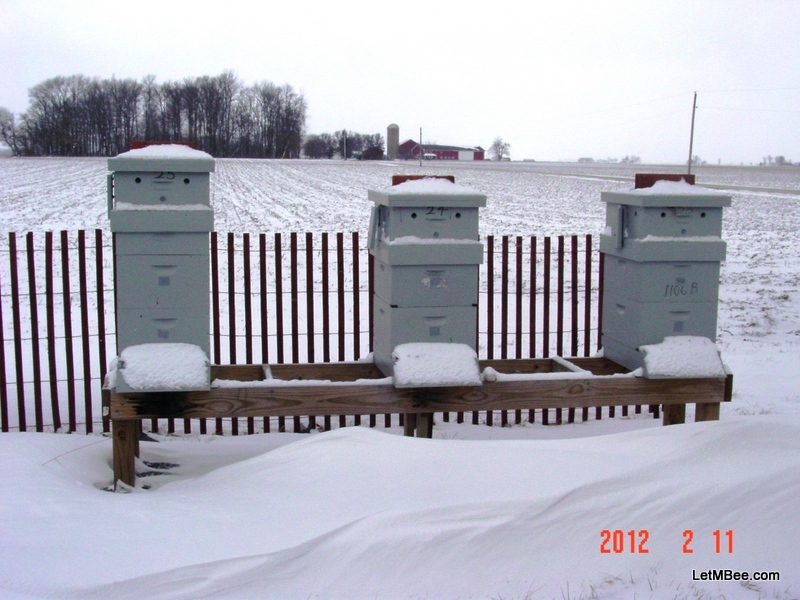 The two hives that were humming, 1005 and 1208 showed obvious snow melt. The silent hive, 1001 had a nice pile of snow on top. I theorize that heat generated by the surviving colonies melted the snow on top since there was no insulation. I don’t know if anyone else will even find it interesting, but I did. We pharmacists are a nerdy bunch. It is too early to determine if this method of overwintering was a good idea or not. The fate of more hives will need to be determined…. more on that in late April. Once the weather breaks and I have a day off I will break 1001 apart and attempt to diagnose the problem. Until then I will just have to wonder. 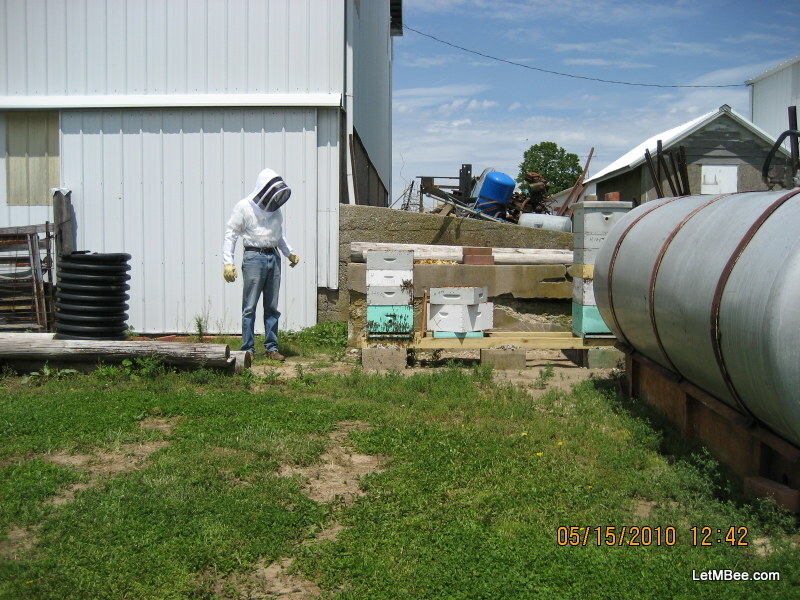 This entry was posted in Cutouts, Experiments, Hive Reports, Posts, What's going on.. and tagged beekeeping, Indiana Beekeeping. Bookmark the permalink. You might be surprised. There’s a hive I thought was dead twice already. I even went to break it down on the last nice day, and they started bubbling out of the bottom box. No responses from previous knocks either. There weren’t a ton and I’m still writing it off in we have many more cold snaps. The other thing I’ve been reading a lot about is the “chill coma” – A friend and I witnessed this already. We broke down a box we thought was dead… pulled out the frames with all the bees looking still and dead. Picked the queen and passed her around, etc. He put her in a bowl and left her on his kitchen table and woke the next morning to her crawling around in the bowl (vigorously) He had left the hive out in the truck over night. So he went out and sealed it up and put it inside before he went to work. He came home and the hive was buzzing. Totally surreal. Lesson, wait for a warmer day to break down your deadouts. You can google “bee chill coma and cold death temperatures” and get a lot of stuff. J.B. Free and Yvette Spencer-Booth wrote extensively about that. I’ve been doing ether rolls on other deadouts for good measure. It’ll be interesting to know how your hive does. Take care. I have left them alone for just that reason. I was unaware of the term “Chill Coma” as a term relating to bees. It is a good term to characterized what I was feeling yesterday morning when I was moving and organizing hive equipment and traps. I had in my journal from last year that the temps were near 80 degrees F mid March. According to weather.com today’s high is only going to be 43 degrees F. Right now it’s 22 at 6:22. I have observed similar behavior and didn’t know it had been named. (See 3 Hives Visited) I know that 1001 had plenty in the way of stores, but the cards are stacked against them because I observed a BUNCH of bees with deformed wing in it last fall. I will keep you posted if and when it ever warms up around here. My fear now is that when Spring finally does hit things are going to happen really fast. The few really nice days we have had have coincided perfectly with scheduled days at work. I can’t wait for a NICE day off. Thanks for reading and giving me a new topic to read about. I think … that all your hives have live bees in. Well, they say that beekeepers are optimistic! At least you have some bees. Mine are now all dead – I wrote about it here. BUT hoping to catch an early swarm soon. The optimism persists! I know that all of them didn’t make it. 3 of them are gonners for sure. I have made it to 18 hives so far and 15 were doing well. I haven’t had time to do much except respond to comments and send e-mails lately. It is about time for my wife to have a baby over here. I have been taking pictures and once she has the baby I will be off of work. I plan on spending some time making new posts and making updates to the OBITUARIES page. I may need you to come up with a headline for me. Why not, in those hives you observe to be weak, inferior, and unwinterable replace the the queen of the swarm you are, as I understand, overwintering in ‘attics’. Thus you force a requeening of a hive with an ailing queen thus ‘killing two birds with one stone.’ The irony of this would be that the swarm’s queen you may in spring find out had worse genetics then the weak queen you had. I do like your thoughts on survival of the fittest in the context of wintering. But the reality of it is if they didn’t create enough honey to winter, then they’re going to die anyways. Or if they didn’t create enough honey to harvest, then they are not profitable. I care that my bees have enough honey to get through winter, but if that is all they can produce me then I’m truly only a hobbyist. If they don’t produce, then I can only be in beekeeping for the sport of it. Nature cannot produce, in the way of genetics, what I require in excess of honey production. Side note, I appreciate your work on swarm traps. I’ve adopted much of it in mine, a much simpler version (in some ways). I may adopt more if I’m not successful. Why not, in those hives you observe to be weak, inferior, and unwinterable replace the the queen…. I feel that is just a bandaid to keep a colony alive. I am not interested in purchasing queens year after year. That is what my first mentor was doing year after year until he just hung up beekeeping because he couldn’t keep colonies alive without requeening every single year. It does nothing for bees in my area or the long term productivity of my operation. Selective pressure is what makes for stronger genetics. Despite the fact that I live smack in the middle of heavy agriculture feral bees are not just surviving they are thrive here. If there were queen breeders in this area AND they were using open fertilization I might consider purchasing from them, but I am unaware of any. I am searching for long term solutions. Perhaps some day if I can get reliable overwintering and good productivity in my colonies I could be that queen producer, but I feel it would probably only be of maximum benefit to people close to my geographic region. Bees from Florida or Michigan are subjected to different pressures than what bees face here in Indiana. Precisely!! Evolution does not occur in a population unless pressure is applied. SEE LINK HERE. I know it is Wikipedia and some people frown on using it as a source, but it is pretty much in line with what I learned taking genetics at Purdue. Purchasing a queen does nothing to improve my genetics here except potentially dilute them. 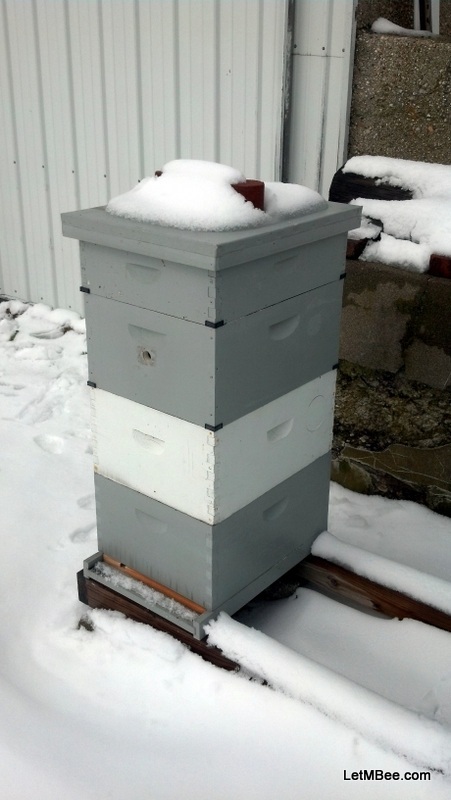 My first goal is to have colonies overwinter….. after I achieve that I will focus on maximizing honey production. I feel the best starting point for this is NOT stock from “who knows where” rather stock that I know overwintered here. Just how much honey are you trying to produce? Do you take American Bee Journal? Last summer Randy Oliver penned a piece called, “Extinction of the Honey Bee?” In it he featured a beekeeper from Indiana named Tim Ives. Tim has been selectively splitting and allowing his splits to produce new queens for several years now. He is reporting production of 300-400 pounds of honey PER YEAR PER COLONY. Despite the fact that he doesn’t feed his bees and he does not treat them. Do you expect more productivity than that? I have no reason to doubt Tim. I have never had a colony produce 300#, but I have had colonies produce over 200. I believe they could have made more if they would have had more supers above them. Given time I hope to achive such goals on a more regular basis. Nature is capable of AMAZING THINGS…. I did a post last September “Bees can Overcome…….”. It was about what the Japanese Honeybee has developed to overcome Asian Hornets. This was not a behavior they got from a Queen breeder. Selective pressure created their behavior. Also take a look at “Saturday Morning Cutout” from last July. That feral colony had amazing honey stores and was extremely strong. Let me know how your swarm trapping goes this year. I don’t know where you are located, but bees here in Central Eastern Indiana should begin swarming soon. I have been seeing drones in several colonies now. I wish you luck. Stay true to your methods! At a time when even state beekeeping associations are introducing California bulk bees and caged queens in mass the local feral genetics need all the supporters they can muster. Don’t worry man… If I am one thing I am suborn…!!! Some bees can’t cut the genetic mustard, but some can. I just got a line this week on 2 feral hives in 2 different locations I had not previously known about. I will be getting pictures soon. Whether I have time to write about it or not………. They are both in locations I knew were harboring ferals. Both places fit what I have come to call the pattern AND both have produced swarm catches in the past. I just didn’t know where the trees were. Found by farmers mushroom hunting, activity must have been very good, because each was heard before it was seen. When asked whether I wanted to cut the bees out I explained that they are worth more to me in there casting off swarms than if I take a chance on hurting those queens. I told both of those guys to just LetMBee!!! !